Dupree, Nancy. Photograph: "Charlie Digging in Hearth": 65-185. 1965. Dupree Collection, Williams Afghan Media Project, Williams College, Williamstown, MA. Dupree, Nancy. Photograph: "Mundigak": 60-R38-6c. 1960. Dupree Collection, Williams Afghan Media Project, Williams College, Williamstown, MA. Dupree, Nancy. Photograph: "Mundigak": 8692. 1960. Dupree Collection, Williams Afghan Media Project, Williams College, Williamstown, MA. Dupree, Nancy. Photograph: "Tools in Situ": A74-122. 1974. Dupree Collection, Williams Afghan Media Project, Williams College, Williamstown, MA. Photograph: 50-62. Dupree Collection, Williams Afghan Media Project, Williams College, Williamstown, MA. Photograph: 51-69. Dupree Collection, Williams Afghan Media Project, Williams College, Williamstown, MA. Photograph: 62-171. Dupree Collection, Williams Afghan Media Project, Williams College, Williamstown, MA. Photograph: 65-M-LD-1. Dupree Collection, Williams Afghan Media Project, Williams College, Williamstown, MA. Photograph: A73-13. Dupree Collection, Williams Afghan Media Project, Williams College, Williamstown, MA. Photograph: Afghanistan - The Pottery - 2. 1920s. Keystone-Mast Collection, UCR/California Museum of Photography, University of California, Riverside, Riverside, CA. Photograph: Afghanistan - The Pottery. 1920s. Keystone-Mast Collection, UCR/California Museum of Photography, University of California, Riverside, Riverside, CA. Photograph: "Mundigak": 8690. 1969. Dupree Collection, Williams Afghan Media Project, Williams College, Williamstown, MA. Powell, Josephine. Photograph: Great Mother Goddess. Special Collections Library, Fine Arts Library, Harvard University, Cambridge, MA. Rowland, Benjamin. Ancient Art from Afghanistan: Treasures of the Kabul Museum. New York: Asia House, 1966. Ustad Mohammad Omar. Untitled Naghma. Sakata Music Collection, 1967. Do you see a face? An important work of art? A religious symbol? Or is it simply a pebble? Some say this is the earliest known depiction of a human, and it was found in Afghanistan. In the 20th century, archaeologists found proto-human remains in Afghanistan. Some of these remains dated back 100,000 years. The discoveries revealed Neanderthal skeletons as well as evidence of stone tools in the region. These are among the earliest traces of the human record. But still, this was only scant evidence to answer fundamental questions about early human history. But another significant find that archaeologists unearthed in Afghanistan revealed evidence from 75,000 years later. It may not seem like much, but to a trained eye, this is a historical goldmine. Settlements in the foothills of the Hindu Kush* revealed very sophisticated tools–thousands of them. Spear heads, pottery shards, and other tool fragments were found together and gave clues that early humans used these tools to hunt and to farm. Another settlement, dating 20,000 years later, revealed unbelievable sophistication. This is the site of Mundigak. 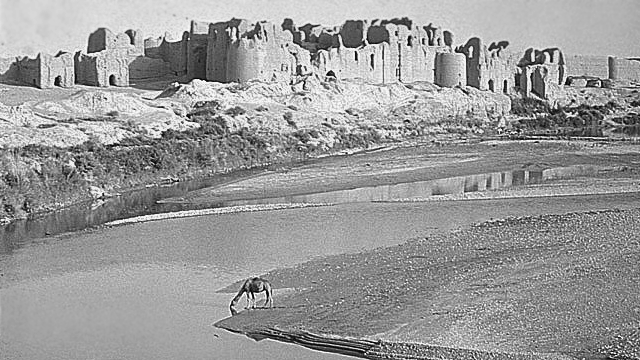 Mundigak sits just outside Kandahar, pointing to the ancient origins of this modern city. Remains of buildings were found, including a colonnaded terrace with red doorways. What remains of these structures, even after all these millenia, is impressive. Many people must have worked together to create a building foundation so solid that its footprint survived nearly five thousand years. Archaeologists speculate that the ruins were of great importance to the people, and were perhaps even religious in nature. The site presented other historical clues, too. These ceramic cups from Mundigak defied the ravages of time to tell us a lost history. The animal and plant motifs show a connection to the natural world. But the materials and labor involved in making these cups suggest something new : to excavate the clay, collect the plants and minerals to make dyes, create an oven, sculpt the vessel, gather fuel for fire–all of this hard work required great knowledge, sophistication, and time. Logic argued that one person alone could not do all this. These vessels, among many others, suggest a division of labor–and one of the first clues of a complex human society. But other objects were not as easy to read. This carved statuette shows a woman. Could she have been a “mother goddess” who represented fertility? Mundigak was the northern provincial capital of the great Indus civilization. Clues abounded to suggest early human connections among civilizations even then. But in the end, these details remain hazy. So, again now, what do you see? One of the earliest human settlements was found in what is today Afghanistan. So begins a long lineage of great civilizations.